There is a robin standing on the old brown wood next to the rare donkey. The tow donkeys are talking about the noisy goose and they’re trying to find out why they’re eating the flowers. Why are the donkeys staring at us? the goose asked. There are beautiful flowers and they’re all colourful and the donkey is smelling it. There are two birds flying in the cloudy blue sky to another country. There is a tiny red robin on the brown fence while staring at the donkeys and geese. Goslings are on the beautiful green path with the geese and they are sniffing with colourful path. 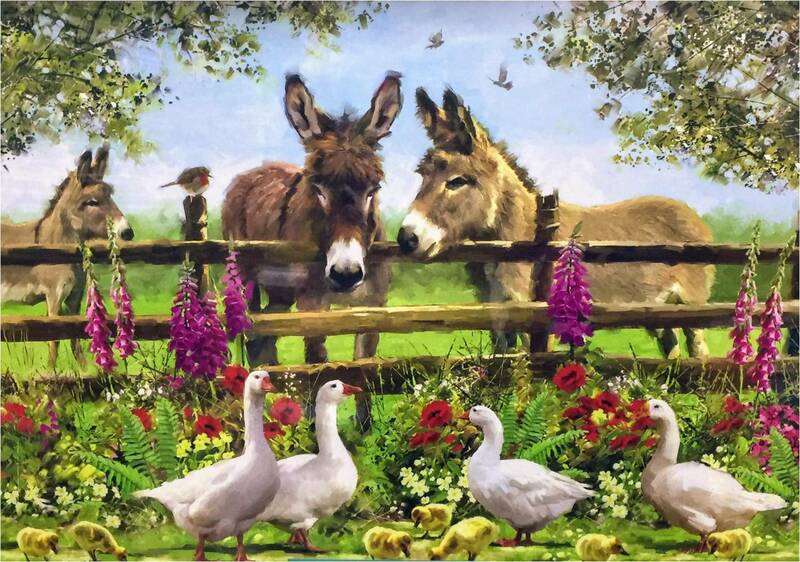 A brown fence is blocking the white geese from attacking the donkeys and there are beautiful flowers attached to it. There are 3 brown donkeys staring at the vicious geese their their goslings. There are pretty blue tiny birds in the sky also flying by the donkeys. Look at those donkeys they are so dirty said the geese and the robin on the fence agreed with them. I do not like those geese all they do is waddle around and it is annoying said the donkey on the right. There is a goose who is annoying the donkeys because it is disturbing their lunch and the donkeys don’t like it. The goslings are eating their dinner but the parents are arguing about where they are going to go to get some food away from here but the goslings don’t want to go. In the field there is a donkey who is jealous of the other two because they get to eat the flowers but he has to eat grass until he is older. I think the robin bird is helping the geese look after the goslings because the robin and the geese are amazing friends. A light brown donkey is telling the brown donkey why they eat grass and why people give the geese bread. At the moment it’s a sunny summer day when four geese are starting to talk very loudly to some donkeys. There are loads of beautiful flowers but the geese are eating the colourful flowers. The yellow goslings are pecking the green grass trying to find some delicious lunch and the robin has shown them how.